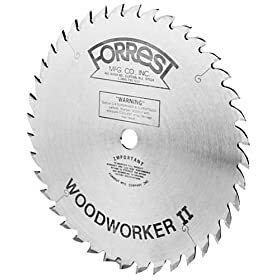 Forrest's blades offer a superior cut that leaves a rip-cut saw edge that is as smooth as if it had been sanded, and a cross-cut edge that is almost mark-free. The blades run very quietly, and backside tearout in plywood is negligible. Each blade is virtually hand-made. The plate is hand-tensioned (up to 15 minutes per blade), superior C-4 carbide teeth are hand-brazed to the plate, and the blade is straightened and restraightened multiple times throughout the process. Think of a Forrest blade as a tool in your shop, not an accessory. Forrest stands behind it's blades by offering a sharpening service that bring blades back to the exact tolerances offered in a new blade. And this same exacting service is available for other manufacturer's blades as well, so they should come back better than new. 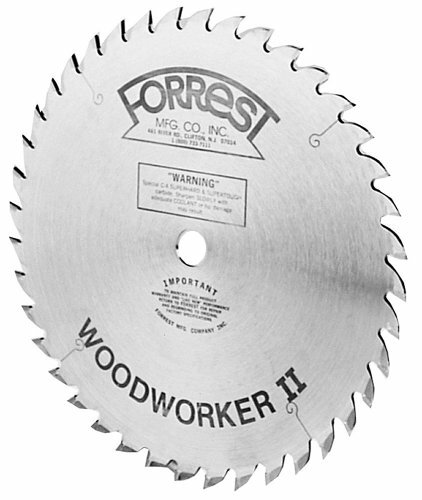 Forrest Miter Master blades work with all makes of double or single miter saws. These professional quality miter saw blades produce tight, perfectly cut miter joints with no bottom splinters. These saw blades are specially designed to cut extruded profiles, bars, and plate stock. A heavier than normal steel plate maintains maximum stability for the best cut. Each blade is hand straightened to run out of .001"/.002" for maximum cut quality. If you can wait for an Amazon sale, it's a superb deal. Otherwise, it's just a superb blade. Worth the money. YOU CAN CUT ABSOLUTELY ANYTHING WITH THIS BLADE BECAUSE OF THE THICKER AND HEAVIER PLATE. WE ONLY USE NEGATIVE HOOKS FOR A STRAIGHTER AND CLEANER CUT. OUTLASTS OTHER'S 3 TO 1 !!!!!! NO WEEBLE WOBBLE WITH THIS BEAUTY.